In the intimate (even stuffy) Cremorne, we are blinded by roaming searchlights. A huge screen looks down upon us from the bleak stage. 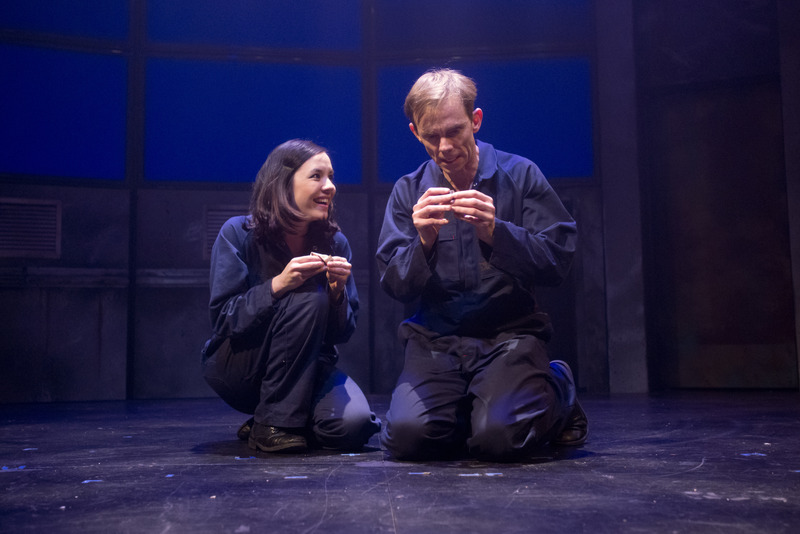 Shake & Stir immerse their audience in George Orwell’s 1984 — a draconian future where “war is peace, freedom is slavery, and ignorance is strength.” Here, the past is malleable and even private thought is public property. Bryan Probets is compelling as Winston Smith, the quietly sharp, nervous dissident who works in the Ministry of Truth rewriting records of the past. The telescreen — a two-way television that both broadcasts and monitors — dominates his home and life. Winston’s internal struggle against Big Brother is broadcast to us even while, in person, he hides from prying cameras. His monologues induce doublethink in the audience: we know this is private; we know we are watching. Set designer Josh McIntosh has stashed the past in crevices and under floorboards. The unfolding of a secret, museum-like room is a special delight. But it’s Optikal Bloc’s visuals that are at the heart of this production. (Ironically, they edited 2013’s season of Big Brother for Nine Network.) Matched with Guy Webster’s suitably overwhelming sound design and Jason Glenright’s always-clever lighting, Optikal Blok evokes a claustrophobic sense of constant surveillance. Unfortunately, the cast can’t quite maintain this sense of dread. Ross Balbuziente, Nelle Lee Julia and Nick Skubij — company co-artistic directors — each seem miscast as cartoonist iterations of their characters: keen patriot Parsons, secret rebel Julia and elderly antiques-peddler Charrington respectively. David Whitney as O’Brien brings a gravity essential to the double-agent role; he is the production’s much-needed metronome, keeping the pace even. There’s a particular bleak resonance in Orwell’s vision: in 2014, we enact doublethink every day; we willingly cling to the devices that monitor and data-mine us. Michael Futcher makes note of these phenomena in his director’s notes. Yet scenes in 1984 that ought to remind the audience of its role in its own panopticon are often played lightly enough for laughs. Winston’s prison experience is at one point reduced to toilet humour. And, significantly, there’s a bitter-sweetness lacking from his frantic connection with Julia. Even the live rats meant to signify terror are, well, really cute. Shake & Stir’s production faithfully follows the plot and text of Orwell’s 1948 novel (I did my homework and read it last week), yet something is missing. No amount of audio-visual saturation can stand in for genuinely felt fear. Opening night, if I understand correctly, was the 101st showing of this particular adaptation; after 124 days on the road, perhaps 1984 is going through the motions. Still, Orwell’s inventive language alone reminds of our tenuous grasp on memory; our disconnection from inconvenient histories; and how easily we might be complicit in our own enslavement. “If you want a picture of the future,” says O’Brien, “imagine a boot stamping on a human face — for ever.” Shake & Stir has long since found its feet; during 1984’s QPAC run, I hope it’ll find its steel-capped boots. 1984 plays until 2 August 2014 at Cremorne Theatre, QPAC.